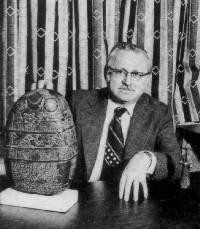 This 2010 interview between Zecharia Sitchin and Alan Boyle, Science Editor, NBC News discussed “his tales of ancient alien visitors from the planet Nibiru — and his campaign to have DNA tests done on a 4,500-year-old Sumerian noblewoman,” whom Sitchin believed may have descended from the Anunnaki. 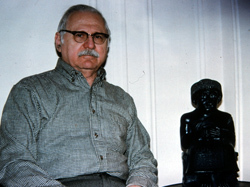 Boyle would later memorialize the passing of Zecharia Sitchin a few months after this interview. 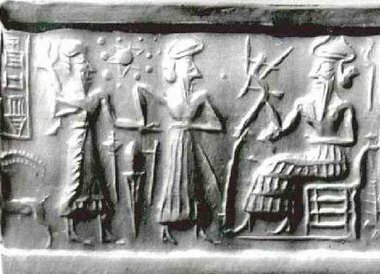 Zecharia Sitchin suggests that the star-shaped symbol and 11 other dots on this Sumerian cylinder seal, known as VA243, represent the sun, moon and 10 planets – including a mysterious world known as Nibiru. He further suggests that beings from Nibiru made alterations in the human genome. Mainstream experts on Sumerian cuneiform texts say Sitchin’s interpretation is wrong. Zecharia Sitchin says he’s willing to stake everything he’s written about alien astronauts on DNA tests that could be performed on the 4,500-year-old remains of a high-ranking Sumerian woman. It’s the latest – and possibly the last – cause celebre for a fringe celebrity. This entry was posted in Interviews and tagged Alien DNA, Anunnaki, Cosmic Log, Interviews, Nibiru, Queen Puabi, Sumer on November 17, 2013 by ZSI. FATE gets the scoop from Zecharia Sitchin modern day linguist and biblical scholar. 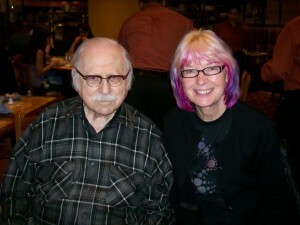 Phyllis Gldea with FATE Magazine conducted a sit-down conversation and interview with Zecharia Sitchin in 2010, where the author goes into some depth about his own beliefs and what led him to pursue his research into our origins. PG: For our FATE readers, could you please tell a brief summary of what you have done, what you have discovered and uncovered, and where did it happen? ZS: FATE, like other magazines perhaps, has a new generation of readers, and that is very interesting. At the beginning of 2009, I agreed to go to LA and speak at some Expo. Almost five years before, I had scheduled one of my big seminar events in LA, in May 2004, and it had to be canceled almost at the last minute. Visiting with family in Philadelphia, I didn’t feel right. My son-in-law there was a doctor and called one of his colleagues, and he examined me. He said I was not far from a fatal heart attack because there was a blockage that was not in a reachable place. He said the only thing that we could do was a heart bypass. I was admitted to the hospital right then and there. I said, “Let’s make a deal. If I make it through the operation, I will autograph the book.” Which obviously, I did. This entry was posted in Interviews and tagged 12th Planet, FATE Magazine, Interviews, Phyllis Galde, Reincarnation on November 16, 2013 by ZSI. 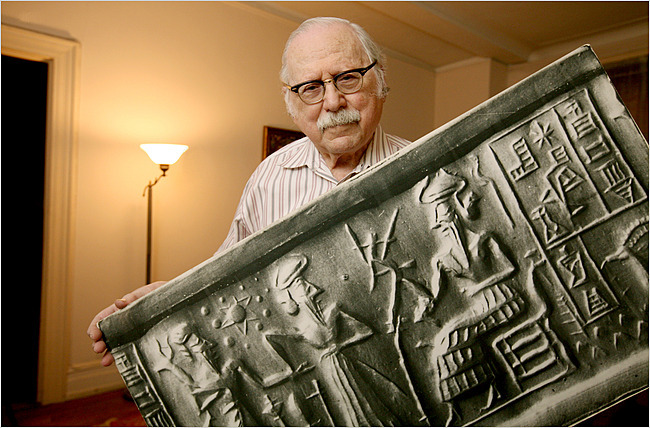 Considered the father of alternative archeology, Zecharia Sitchin has a profound knowledge of modern and ancient Hebrew and many other Semitic and European languages. This knowledge has enabled him in his research of such ancient cultures as Sumer, Egypt, and Mesoamerica. One of approximately 200 scholars on the planet who can read and understand ancient Sumerian, Zecharia Sitchin has written a series of intriguing books including The 12th Planet, The Wars of Gods and Men, When Time Began, Stairway to Heaven, and The Lost Realms (Bear and Company). These books deal with Earth’s and humankind’s histories and prehistory and are based on information actually written on clay tablets by the ancient civilizations of the Near East. Born in Russia, raised in Palestine, educated in England, and a leading journalist and editor in Israel for many years, he now lives in New York. In a rare interview, we had the opportunity to ask Zecharia Sitchin about his transformational journey which has lead him to the well-researched and documented discovery that our ancestors came from the stars. This entry was posted in Interviews and tagged Anunnaki, Connecting Link Magazine, Interviews, Michael Starwyn, Sirona Knight on November 14, 2013 by ZSI. Corey Kilgannon of the New York Times talked with Zecharia Sitchin in 2010, discussing his daily routine living in New York city as well as addressing topics from the Earth Chronicles books. Sitchin was 90 years old when giving this interview, and still appeared as quick witted as ever. WHERE did humankind come from? If you’re going to ask Zecharia Sitchin, be ready for a “Planet of the Apes” scenario: spaceships and hieroglyphics, genetic mutations and mutinous space aliens in gold mines. It sounds like science fiction, but Mr. Sitchin is sure this is how it all went down hundreds of thousands of years ago in Mesopotamia. Humans were genetically engineered by extraterrestrials, he said, pointing to ancient texts to prove it. This entry was posted in Interviews and tagged 12th Planet, Corey Kilgannon, Interviews, New York Times on November 14, 2013 by ZSI.